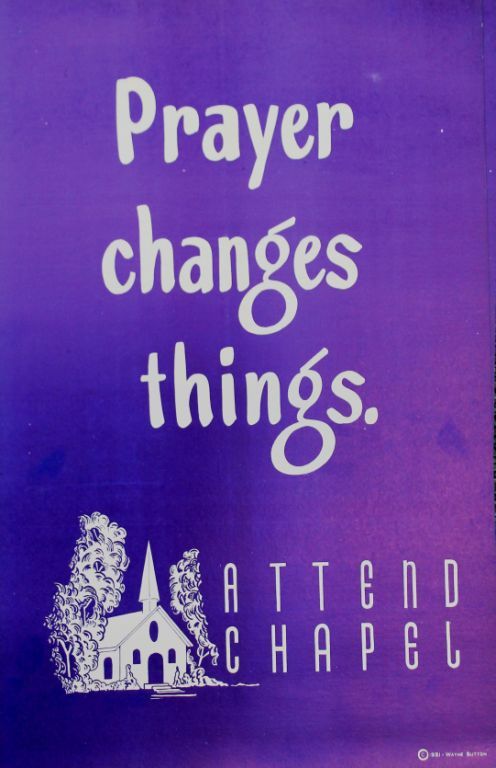 “Prayer Changes Things,” 1951 (courtesy of Chaplain Bob Nay). 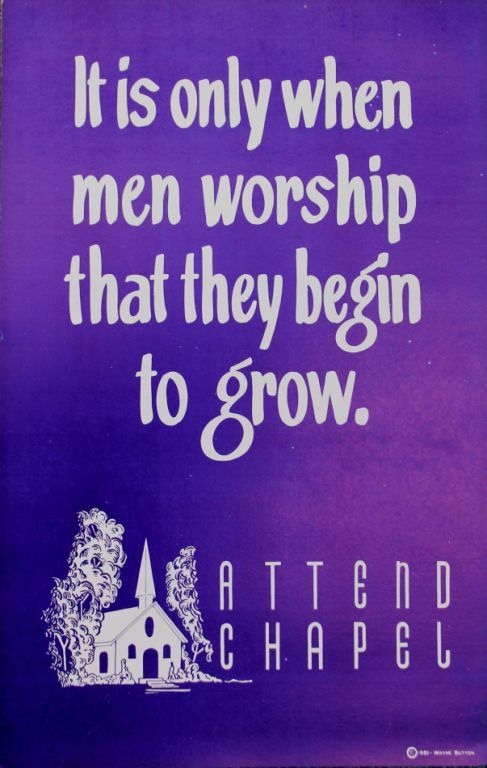 “It is only when men worship that they begin to grow” 1951 (courtesy of Chaplain Bob Nay). 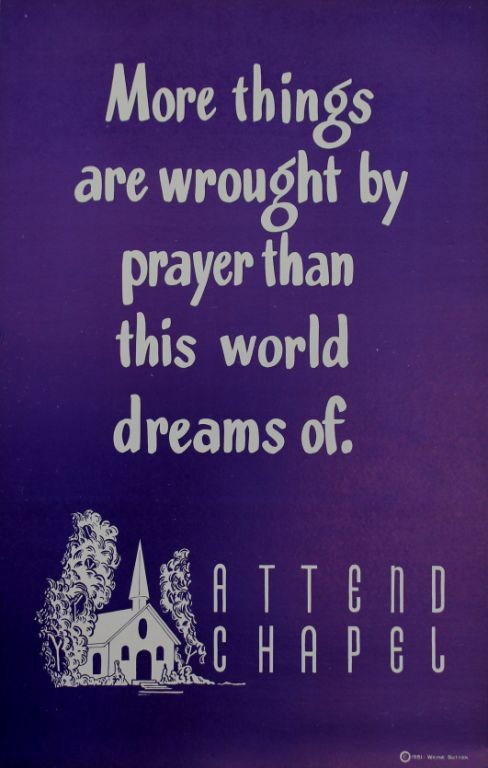 “More things are wrought by prayer than this world dreams of” 1951 (courtesy of Chaplain Bob Nay). “168 hours in a week. 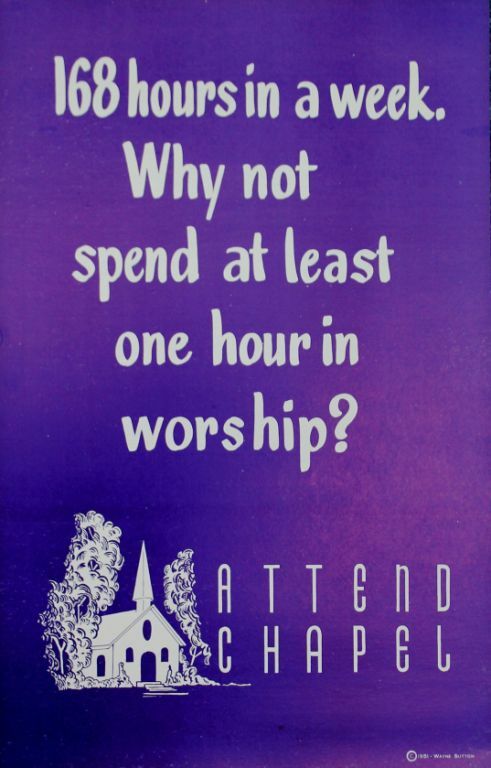 Why not spend at least one hour in worship?” 1951 (courtesy of Chaplain Bob Nay). 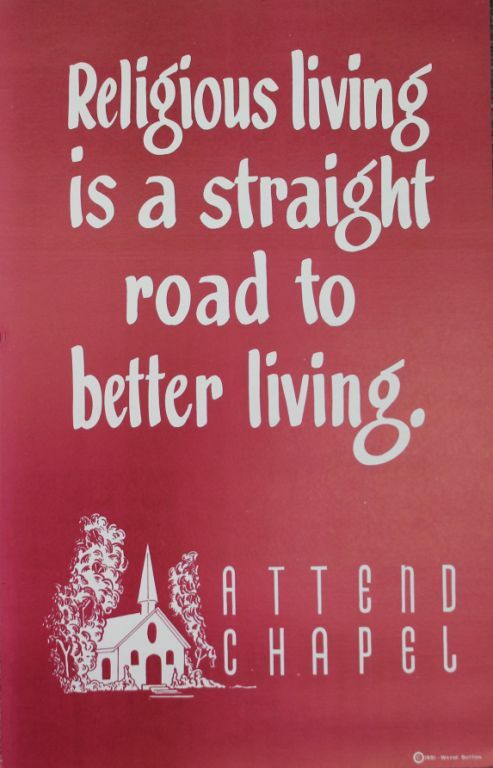 “Religious living is a straight road to better living” 1951 (courtesy of Chaplain Bob Nay). 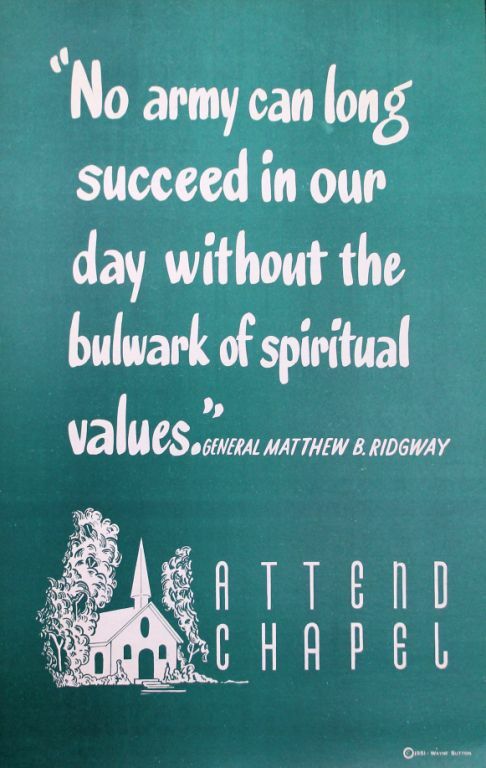 ” ‘No army can long succeed in our day without the bulwark of spiritual values’ -General Matthew B. Ridgway” 1951 (courtesy of Chaplain Bob Nay). 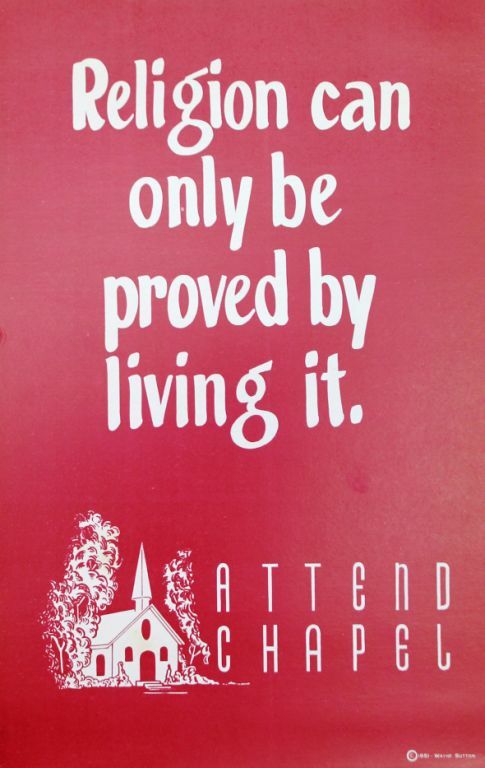 “Religion can only be proved by living it” 1951 (courtesy of Chaplain Bob Nay). 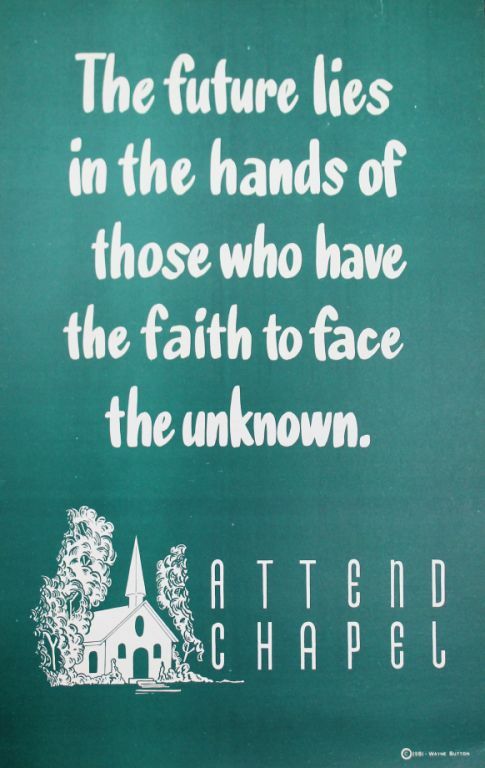 “The future lies in the hands of those who have the faith to face the unknown” 1951 (courtesy of Chaplain Bob Nay). 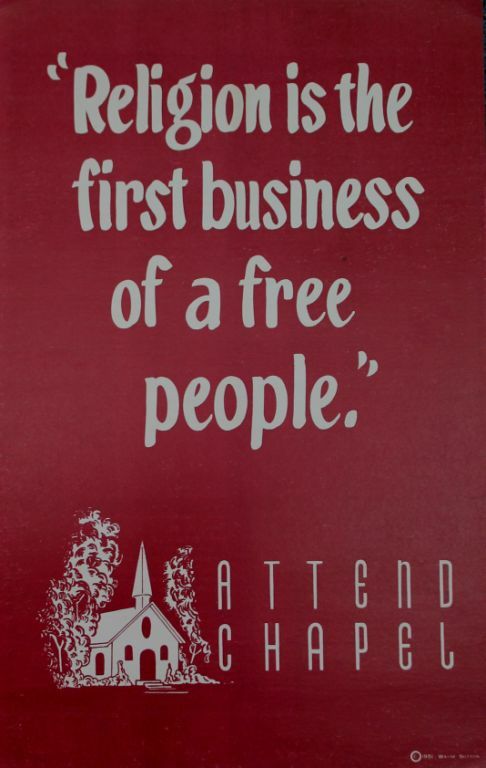 “Religion is the first business of a free people” 1951 (courtesy of Chaplain Bob Nay). 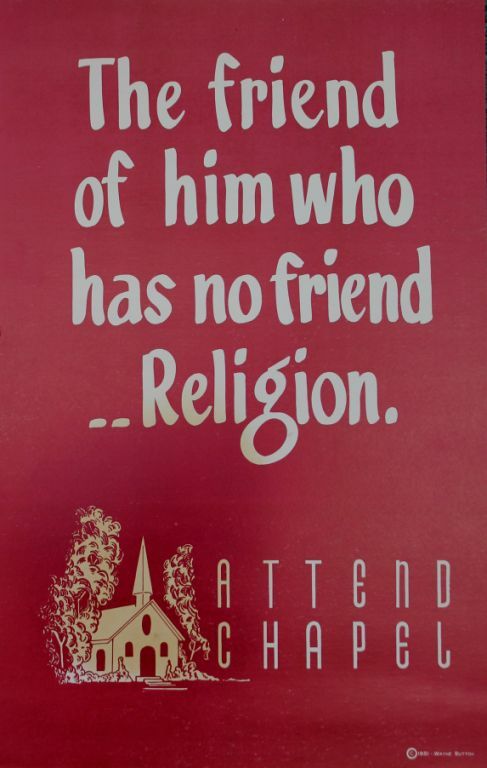 “The friend of him who has no friend…Religion” 1951 (courtesy of Chaplain Bob Nay). 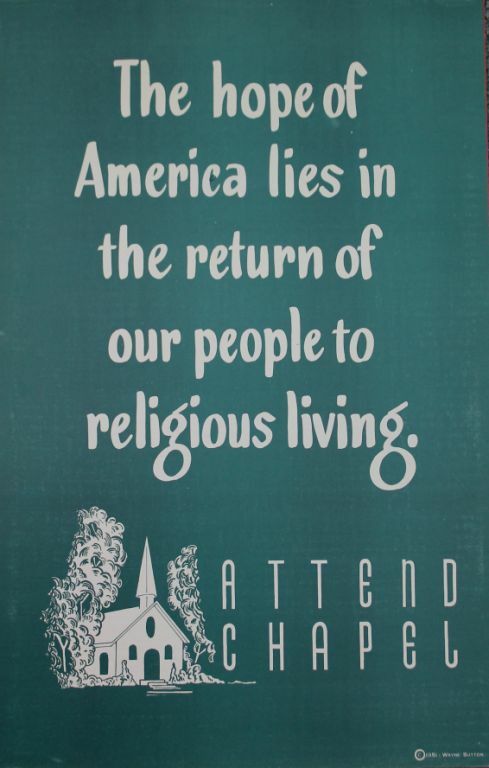 “The hope of America lies in the return of our people to religious living” 1951 (courtesy of Chaplain Bob Nay). 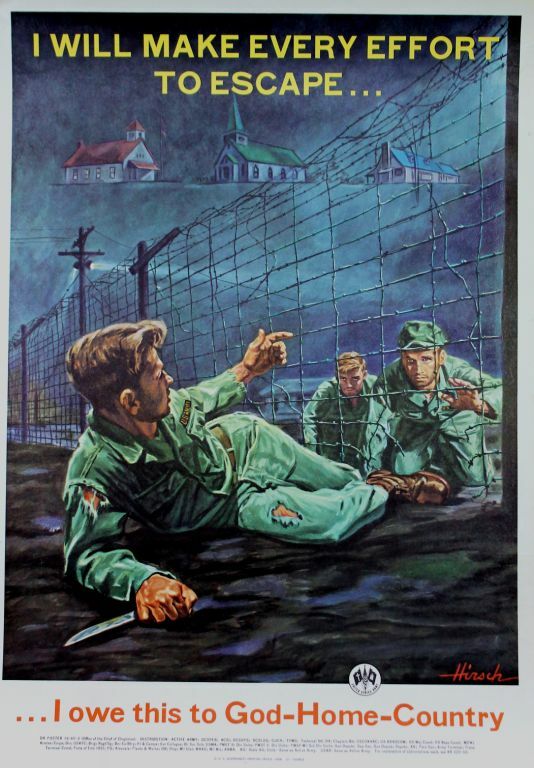 “I will make every effort to escape…” 1958-60 (courtesy of Chaplain Bob Nay). 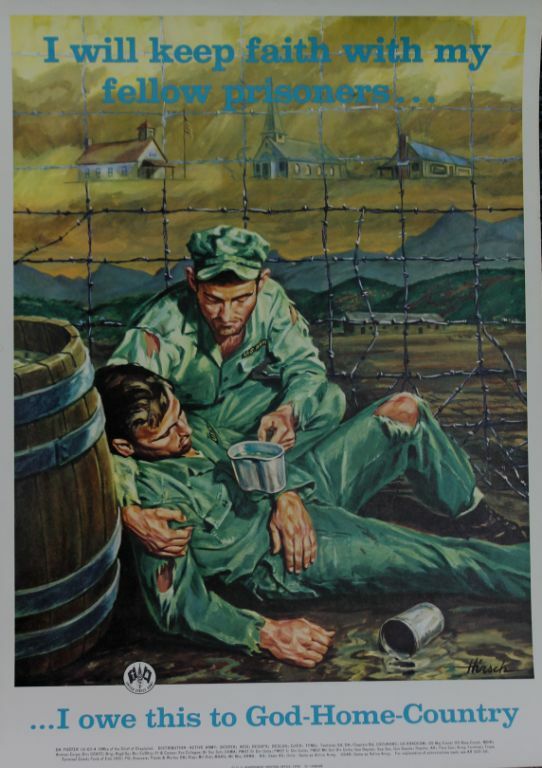 “Only name, rank, service number and date of birth…” 1958-60 (courtesy of Chaplain Bob Nay). 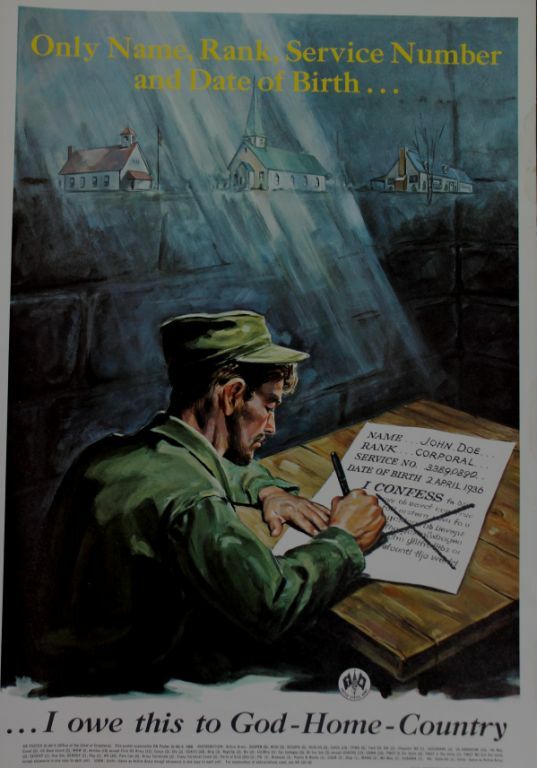 “I will keep faith with my fellow prisoners…” 1958-60 (courtesy of Chaplain Bob Nay). “I will trust in my God and the United States of America…” 1958-60 (courtesy of Chaplain Bob Nay). 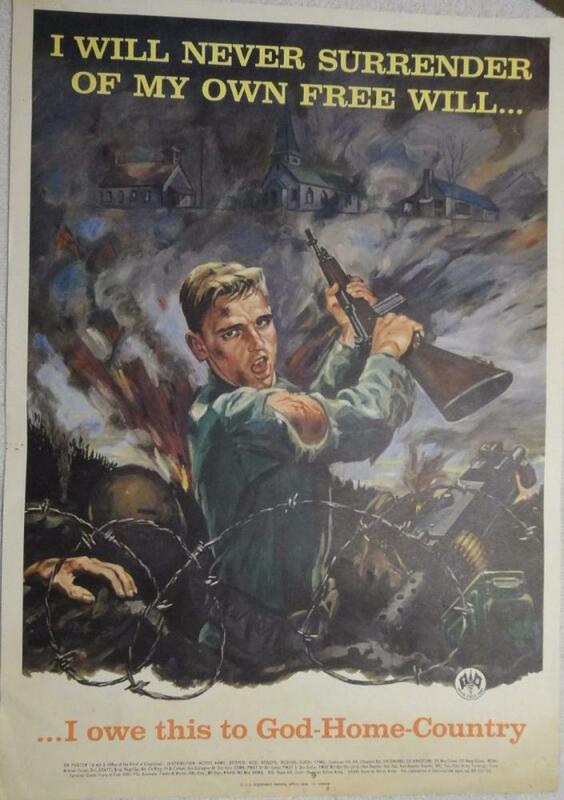 “I will never surrender of my own free will…” 1958-60 (courtesy of Chaplain Bob Nay). 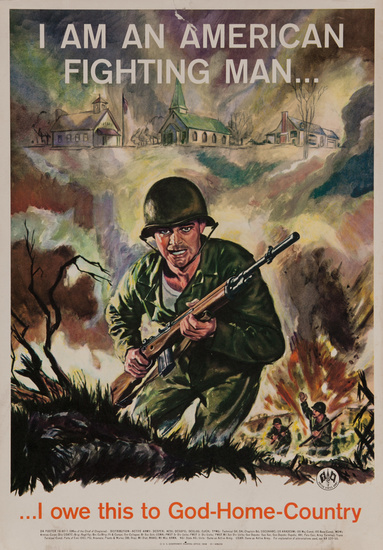 “I am an American fighting man…” 1958-60. Note WW2-era Cantonment Chapel in the background (courtesy of Chaplain Bob Nay). 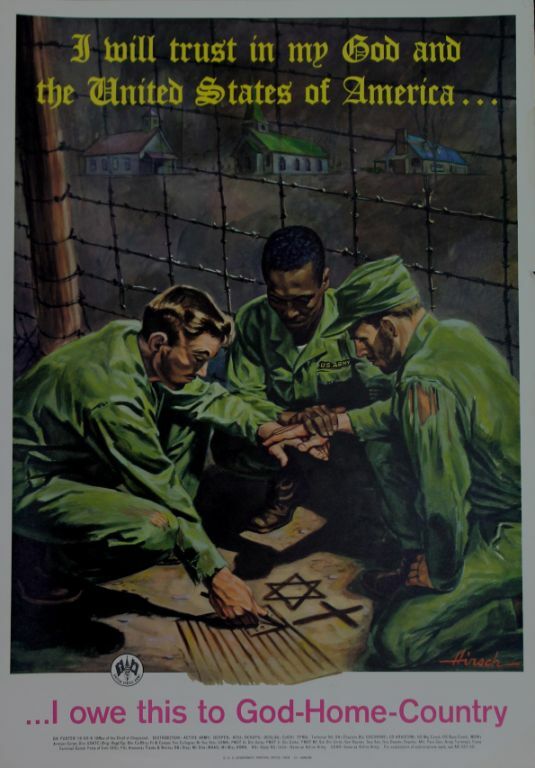 In the 1980s the Army Chaplain Corps produced a number of 24″ x 36″ “motivational” posters that were apparently distributed to unit chaplains to hang in their areas. They were also available in 9″ x 12″ photographic prints. 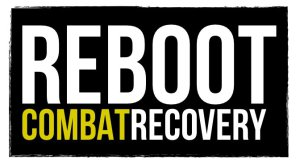 When I was enlisted in the ’80s, serving at Fort Riley, KS, I remember seeing a couple of these hanging in the HHC Orderly Room of DIVARTY, 1st ID. “Confidence Begins Within…” (author’s collection). “Excellence Begins Within…” (courtesy of Chaplain Bob Nay). “Respect Begins Within…” (author’s collection). “Quality Ministry is Maintenance…and more” (author’s collection). “Quality Ministry Is a Servant Ministry…for You” (author’s collection). “The soldier’s heart, the soldier’s spirit, the soldier’s soul, are everything. -General of the Army George C. Marshall” (courtesy of Chaplain Bob Nay).